LIVERMORE, Calif. — Volatile organic compounds can be found in the air — everywhere. A wide range of sources, including from plants, cooking fuels and household cleaners, emit these compounds directly. 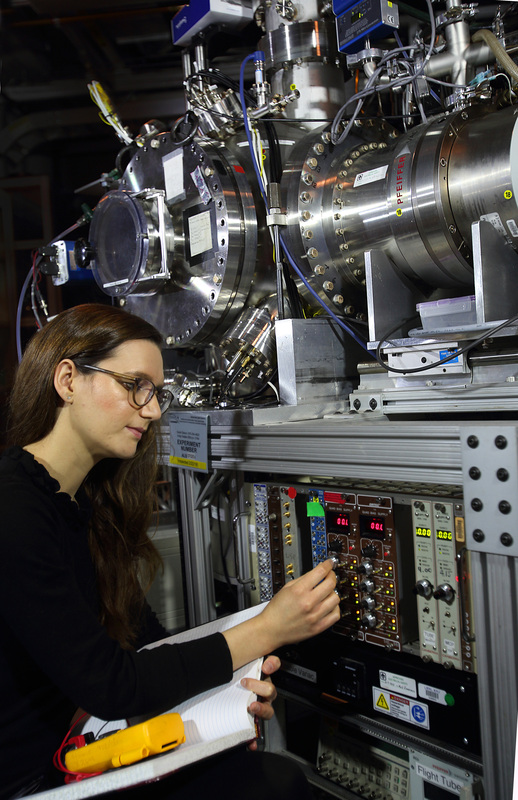 They also can be formed in the atmosphere through a complex network of photochemical reactions. 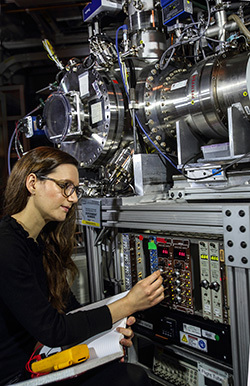 Rebecca Caravan, Sandia National Laboratories postdoctoral appointee, adjusts the Sandia Multiplexed Photoionization Mass Spectrometer that was used to conduct research on volatile organic compounds. (Photo by Dino Vournas) Click on the thumbnail for a high-resolution image. Professor of Atmospheric Chemistry at the University of Leeds Dwayne Heard, third from left, recently visited Sandia National Laboratories’ Combustion Research Center. 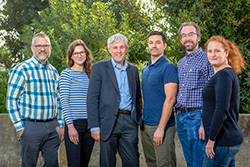 From left, Craig Taatjes, Rebecca Caravan, Heard, Lenny Sheps, David Osborn and Judit Zador. (Photo by Dino Vournas) Click on the thumbnail for a high-resolution image.